For the fourth year in a row, the colour white has maintained its position as the favourite paint finish for new car buyers in the UK. That’s according to data published by the Society of Motor Manufacturers and Traders (SMMT). 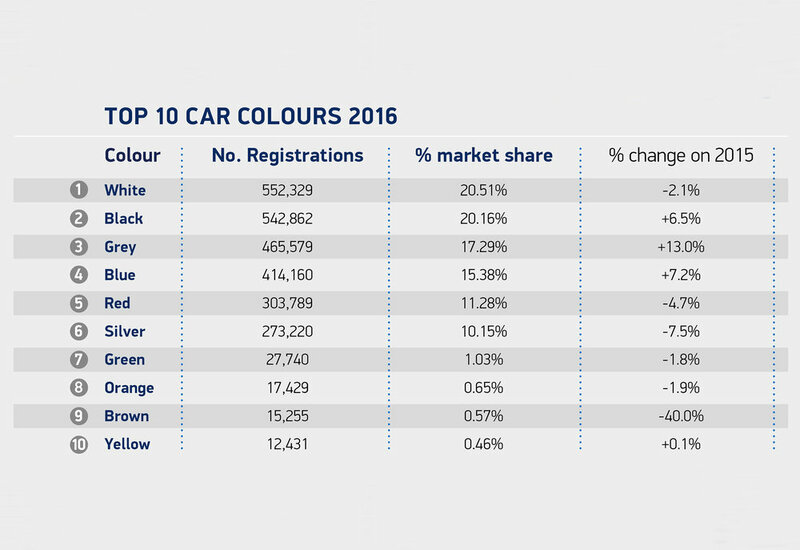 More than half a million new car buyers chose the colour in 2016 – a fifth of all registrations – although figures show its popularity is starting to fade with demand falling -2.1%, the first drop since 2005. White and black are the nation’s two favourite car colours – of the 2.69 million new cars registered in 2016, white (552,329) and black (542,862) took more than 40% market share. While white maintained its lead in Scotland, Wales and Northern Ireland, in England it was overtaken by black as the new car colour of choice. Nationally, the third and fourth most popular colours were grey and blue, both gaining market share. Meanwhile, yellow cars appeared in the top 10 for the first time since 2013 at the expense of mauve, which dropped to 11th place. Regionally, black topped the chart in the South East while also overtaking white as the favourite new car colour in East Anglia and the West Midlands. However, white continued to be most popular across the rest of the country, with buyers in the South West, East Anglia, East Midlands, Yorkshire and the North all following the national trend. Of the biggest winners and losers in 2016, demand for Pink grew by 82.7% to 3,527 units. A 44% rise in demand for Bronze cars saw a record 8,902 people specify the colour in 2016 and Turquoise’s popularity grew fourfold last year, from just 792 registrations in 2015 to 2,718. Meanwhile, demand for Brown fell by 40.1%, dropping it one place to ninth. Appetite for beige also fell by 27.6% to under 10,000 for the first time since 2000 with 8,426 cars registered, while Silver saw the biggest volume decline, falling 22,209 - with 273,220 buyers choosing it compared with 843,870 in its heyday back in 2004.